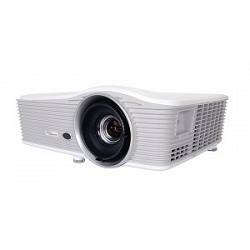 Optoma EH515 Projector 1080p (1920x1080), 5500 ANSI Lumens, 10.000:1 contrast, 1.8X Zoom, H and V Lens shift, H and V Keystone, 4 Corner adjustment, Display port, HDMI (MHL), VGA In/Out, Wired remote, 13lbs, Warranty: 3-year Optoma Express Replacement, 1 Year lamp warranty. 4 corner Geometric Correction for easy installation of basic stacking solutions or on uneven walls. 1.8x Zoom - excellent image from a short or long distance. Vertical/ Horizontal keystone and lens shift for various applications. Bright Projection at 5500 ANSI lumens for large installations. Full Control over LAN and RS-232 using Crestron, IP Link, Extron PJ-Link, and Telnet. Two 10-Watt speakers for excellent sound. The Optoma EH515 is a Full HD professional Installation projector, ideal for corporate environments, houses of worship and Pro-AV installs. EH515 DLP technology provides accurate colors and great contrast for dark and white images. Part of Optoma’s #1 high-definition fixed lens installation family of projectors, the EH515 is furnished with advanced features to facilitate quick installation, high brightness and low total cost of ownership. Features include: Four corner correction (ideal for image stacking or uneven walls), Horizontal and Vertical Lens shift and Keystone together with x1.8 zoom ratio, permit a quick setup and easy usability from any angle. Equipped with a variety of inputs, including HDMI built in MHL technology, allows you to connect to a wide variety of HD devices to easily display your content. In addition, the environmentally friendly EH515 has energy saving features including Eco+ lamp power management, <0.5W standby mode and auto power off, saving you both time and money by prolonging your lamp life. Order in the next 11:04:36 Hours to Ship Today Place your order by 3:30 PM Today and your order will ship the same day. For further details and delivery estimates check our shipping page. Remember to select the desired service level needed in your cart. All orders are subject to verification. International orders are processed the next shipping day.